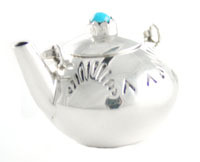 Sterling silver miniature tea kettle has lid with one 3mm turquoise stone. The kettle is stamped and has a wire handle. It measures about 3/4" high with turqujoise lid, and 3/4" diameter wide and spout is 3/8" long. It does have some stamping on the top of the pot that will vary. Navajo hand crafted by Wesley Whitman.